Mani is one of the peninsulas of the Peloponnese and one of the most interesting areas that one should visit during a Peloponnese tour. The area is divided in two prefectures of Peloponnese: Messinia and Lakonia. Once one of the poorest areas of Greece, nowadays one of the best travel destinations that will introduce you to real Greece and charm you with its simple and minimal architecture. The architecture of the area is completely strict due to the wildness of the landscape. Stone houses and buildings create a picturesque destination in which one may find calmness and enjoy the peace of the Peloponnesian environment. 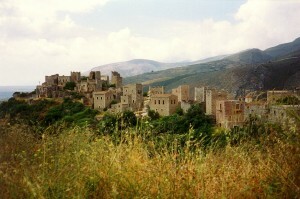 In Mani you will not find the hustle and bustle of other areas. The region is the perfect travel destination in order to enjoy calm and relaxing vacations in a marvelous environment. Crystal clear beaches, wild mountains, small harbours, picturesque villages make the region the perfect destination for your tour in Peloponnese. You may choose the area for a stop over during your tour or for a relaxing full-time vacation in one of the sea-side luxury resorts. Touristic development has brought a lot of improvements, preserving at the same time the quality of the environment. During the last years the infrastructure of the area has been improved and it is really easy now to reach most of the villages in about one hour from Kalamata or three hours from Athens. Both cities feature international airports with flights to and from all over the world, which makes the travel to Mani even easier and more convenient. In Mani you will find both high quality resorts, as well as small vacation rentals that offer great value for money accommodation options. The luxurious hotels of the area have by default the strict architecture of Mani which blends magnificently with the environment, while at the same time they offer high quality features and services. The smaller establishments offer low hotel rates and of course the well known traditional Greek hospitality. Make sure that you will reserve your hotel in advance! Rates vary depending the period of your trip and the time of your reservation. Check online for previous guest reviews, check the best hotels in Mani in Peloponnese Tour pages and make the best accommodation choice that fits your needs. Mani is an area with a lot of small restaurants, serving traditional food created with local ingredients. In every small village you will find a lot of tavernas and meze restaurants. In the area you will find only a few gourmet restaurants, which are located mainly in 5 star and 4 star restaurants. While visiting Peloponnese you should better make an online review of the available restaurants in order to make the best choice for lunch or dinner. Usually traditional restaurants don’t accept reservations in advance, so you should visit them early in order to find a table. Greeks dine after 9 pm so it won’t be that difficult. Please note that most restaurants do not accept payment by credit card, so you will need to have enough cash with you.